Note: The following answers were given by Darlene, but some statements have been modified slightly and some answers have been shortened for clarity. Question 1:What is unique about the clubhouse? At 9 o’clock, in a lot of places, you do this, then at 10, you do this, then at 11, you do this, then at 12, you do this. We’re unstructured, and we don’t have allotted time for anything except lunch. That’s the only time, and that’s on purpose. I want a relaxed atmosphere. They’re people. A lot of people don’t give people with special needs credit for their ability, and it is amazing how much their families do for them when they don’t need to. Because they’re people, they need to have the same opportunities as the “typical” community out there. It’s important to me that they have the opportunity to express themselves and not tell them all the time what to do and how to do it and then do it for them. We’re the total opposite of all that I’ve just said. 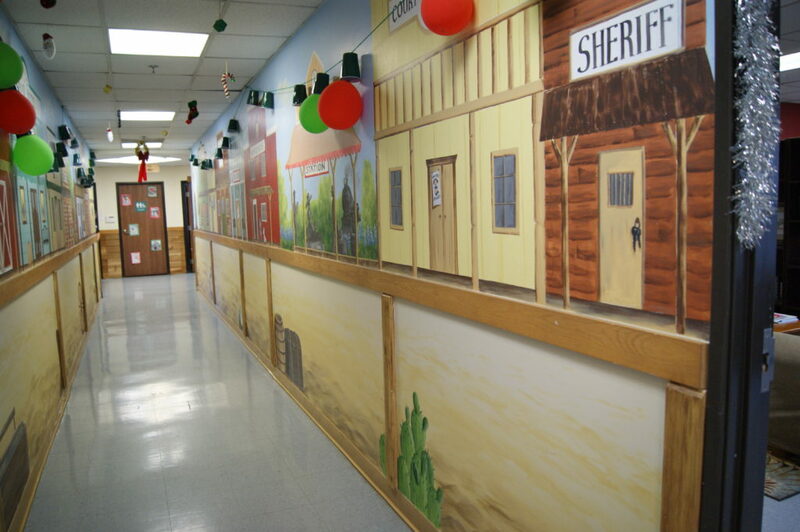 When you walk into our “program” (and I don’t like HAB terms; I don’t like anything that sounds institutional), you see murals on the walls. Not just in this building but also in our original building. And brightness and a wow factor. I love it when people walk into our building and say, literally, “Wow!” and they haven’t gotten past the foyer! But it’s just a different atmosphere. You don’t get an institutional vibe from it. We always have one kid with a profound disability in our program – only one. And the reason for that is that we don’t have enough staff to accommodate a one-on-one situation, but we always have one. But the reason for that is to get them out of a profound environment so that they can grow. They’re not going to grow in an environment where they have nothing to look forward to. But if I had a whole bunch of profound people in our program, it would defeat its purpose. Question 2: Tell me why you focus on serving young adults with special needs, kids between 12 and 22. 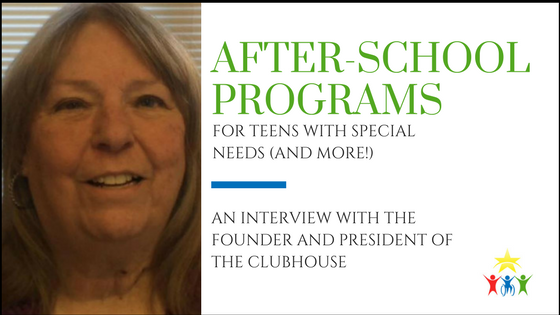 When we got started, there was no such thing in our area as an after-school program for teens and young adults with special needs, kids that were still in the school program. So, we started as an after-school program, and then I found out there weren’t any other after-school programs in the entire state of Texas back then. After school, they would come be in our program for two to three hours. We had the same philosophies then as we do now of being unstructured. We only had 12 kids back then, eight that showed up every day. The building was very tiny. One room in our new building is the size of the building we left, so it was pretty small. But it was a very close-knit family. We’d all sit down together and play Uno. Everybody was playing; nobody was off to themselves, being antisocial or being timid. Question 3: Did the realization that there were no after-school programs for children with specials needs come from your being a mother of a son with Down Syndrome? I had been self-employed for 14 years, so I cared for my son, Jonathan, because I worked out of my home. I had no need for any kind of childcare. But 9/11 hit, and I lost the majority of my business because everybody outsourced to another state, and so I was down to $100 a month of income. When I started The Clubhouse, I was on food stamps, so I wasn’t rich, but I had said to the Lord, “I’m unemployed now. What do you want me to do?” and he immediately reminded me about the need for after-school care. What do other people do with their kids after school? What was I going to do now that I had to get a nine-to-five job? What am I going to do with Jonathan after school? There’s nothing. He was 14, and at that time, he had come up to me and said, “Mom, I want friends,” in his limited speech. He’s not articulate. And when The Clubhouse started, he said – and he said it perfectly – “Mom, I have friends!” It was kind of a tear-jerker, and I use it a lot to watch women cry! They like it when I share that. But that’s basically why it started – because I needed a place for my son after school. And it still bugs me! What do people do with their kids if they don’t get home until six? And what’s happening to these kids that are in the school system? I did a little research and discovered that they’re just sitting at home with a neighbor or sitter, doing absolutely nothing. They’re not being entertained by that person. They’re just there to make sure they’re safe, but they’re not playing a game with them. They’re not doing anything. It might be Grandma, but she’s in the kitchen cooking, and she’s not teaching him or her to cook. And that’s not true for all families, I’m sure. There are those that take the extra mile to do stuff. But overall, they just sit around doing nothing, and I didn’t see why they couldn’t do the same thing they’re doing at home but here and with other people, being socialized. Now That The Clubhouse Is Expanding, How Will Ages Be Separated? Question 4: How do you separate age groups? You have a very free-form structure, so how do you keep the young participants away from the adult participants? You have to remember that these kids are intellectually challenged, and they’re probably all around the same mental age group. We never separated them because of their age, but we certainly kept a watch on certain people. If people can’t control their hormones, then they can’t be in our program anymore. It doesn’t matter if they’re a girl or a guy. A young 16-year-old girl might entice a 30-year-old, and so we just had to set the rule. I don’t care what they do when they leave our building. We can’t control that. But we have a right to control what they do when they’re inside this building. How Is PDA Monitored at The Clubhouse? Question 5: How are public displays of affection monitored and disciplined at The Clubhouse? Kids who have Downs want to hug, and you don’t go, “DON’T HUG ME!” That’s just too rude. So, we have a three-count rule that if they want to hug you, that’s alright. We just have to count to three. And they all know it. They’ll even count: “One, two, three!” So, they understand that. But we have this one boy who really likes to hug, and so what I do – because I already know he’s going to want to hug me as soon as he sees me – I already have a bump ready. So, we encourage the staff to use the bump or a high-five and not the touchy-feely stuff, but if they want that then it’s the count of three. Concerning guy-girl things between students: They can’t be on the same sofa. That’s a rule in our building: A guy has to move if the girl was there first, or vice versa. We don’t give them the opportunity to get touchy-feely. We know where all the kids are. If I were to go up to any staff at any point and say, “Where is Jonathan?” they better tell me. They better know that he’s in a certain room. Not that they’re counting heads. I don’t require them to count heads, otherwise they’d be counting all day long! They’re always moving! Question 6: Talk to me more about The Clubhouse expansion. Are you just expanding hours by starting a day program or are you expanding how many people you serve as well? The Clubhouse Is Allowing Students to Stay Once They "Age out"
It has nothing to do with the time. It has everything to do with the ages. We still advertise that we stop at 22, so we don’t take anyone in that’s over 22. But there are exceptions to that. But because they came in when they were at the right age, but now they’re 23, we don’t kick them out. Our oldest right now is 43, and she’s a woman that has Downs. We have some kids in their mid-thirties. Most of our young people are in their mid-twenties. We have kids that have been coming since Day One. We don’t normally take them if they’re over 22, but there are exceptions to that. If they’re not going to be a problem child, let them in. They need a place to be, and there aren’t a whole lot of choices. This past summer, our board voted to expand and create an adult Clubhouse. We now have a waiting list for adults who want to be in our program. We have also just picked up a bunch of new school-aged kids. So, the plan is: Next month, we’re meeting with the City of Bedford to discuss some land that we want to purchase, which is directly to the east of where we are now. The problem is that they just passed a $78 million thing to renovate all that land around us as a city park, and they want to build a new multi-purpose rec center. But I’ve been talking to City for the last three years about us wanting that land one day, so they know we want it. They want to use the land we want as a parking lot, but they don’t have to use it as a parking lot. So, we’re having a meeting to see if they would sell us the land or donate the land, but for some reason word got out that we might be interested in selling. The City also wants our building, so that way they’d have that entire quadrant. We don’t want to sell. We want the land next to us. There’s not a lot of land undeveloped in Bedford. Everything is taken up for the most part, but there is some land. All we need is two acres. If we get the land, the plan is that the current building will be for the young group. A gymnasium with bleachers will be built next to it, and the older group will be part of that new building. There will be a sharable gym, so there will still be contact with older kids and the younger group. That’s the plan for the future, which in the next two years should be up and running. It’s all hinging on where the land is. We have people right now who are ready to build at cost or for free. We are still in negotiations with the city and there is some talk about 4 to 5 acres not too far from where we are. We’ll just have to wait and see what the Lord opens up for us. Question 7: Let’s talk about one of the books you wrote, Without U: Raising a Child with Down Syndrome. Give me the sales pitch and the blurb. I don’t sell them. I give them away. I don’t have a tax ID, so I just give them away. Concerning the book: I didn’t keep a journal, but I did keep notes, as Jonathan was growing up, about the first time he blew raspberries or when he first crawled – all that was written down for his early, early years. The book was written mainly for new parents. It’s a very practical book. It’s not a book where you start at the beginning and then you read it through to the end. You can start anywhere. The essays in it are two pages long, and that’s it. It’s really easy reading. You don’t have to rely on the previous pages. 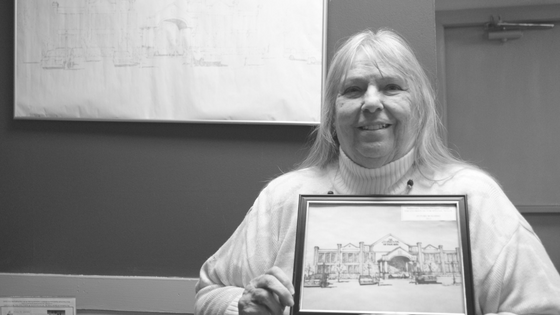 Early years, the Clubhouse’s primary focus was to give teens and young adults with disabilities a place to stay after school, but are now working on expanding further to include adult ages. Help The Clubhouse expand by donating to their cause today. 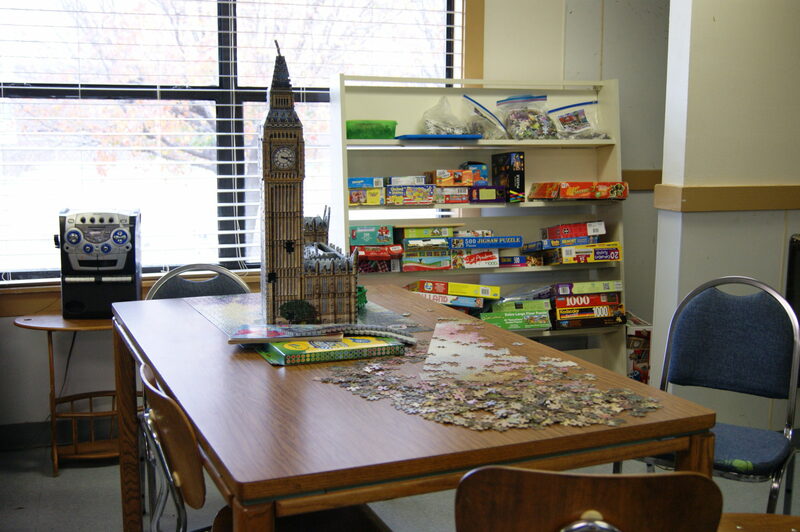 Achievement Center of Texas is a day care and day habilitation center for children and adults with special needs. Donate today to help us get supplies for our upcoming Special Arts Festival, to scholarship students who want to take dance classes but can’t afford them, and more. Click the button below to donate. Amanda Woodard doesn’t have just one passion, but if you must give her a label, “Writer” would be the best fit. What she has learned about disabilities from Achievement Center of Texas has literally changed her life, and she wanted to help spread the word about the center through her blogs and interviews. When she’s not at work, she’s reading mystery novels, practicing self-care and learning new things. For more about Amanda, visit her website. This is well-done! Thanks for making others aware of The Clubhouse for Special Needs. I will be sharing on facebook and other medias.